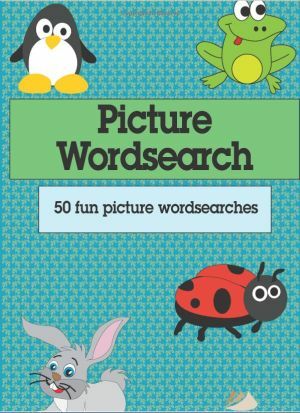 Welcome to this selection of 50 brand-new picture wordsearch puzzles. The puzzles are exactly like normal wordsearch puzzles, however there is only one word to find in each puzzle grid. The word that you must find is shown as an image below the puzzle grid. To find the word that is hidden in the grid you must guess what the picture is first. If you get stuck, turn to page 56 for a list of all the words. So how does a picture wordsearch work, and who is it suitable for? Well, these puzzles are particularly enjoyed by children. Rather than having a large list of words to find there is just one, combined with the added fun of working out what that word is from the picture and the word grid. These puzzles can be tricky however - because the letters in the grid are all made from the letters of the word that you need to find! 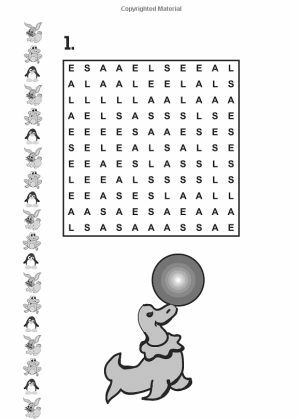 Take a look at the sample to the right, and you will see that the picture is of a seal, so the word to find in the wordsearch grid is seal. However, a quick look at the grid of letters will reveal this is not as easy as you think, because the only letters to be found in the letter grid are S, E, A and L - the letters that make up seal. It might be hard to think that the word is only there once, but it is! How quickly can you find it? There are 50 hidden word picture wordsearch puzzles in this book, and there is a list of all the words that need to be found in the grids too so if you aren't sure whether it's a rabbit or a bunny, there are two forms of help: checking at the back, or just looking at the grid and seeing if the letters are B, U, N, Y or R, A, B, I, T.
We hope you enjoy these puzzles and if you'd like to see more or have any other ideas for picture puzzles you'd like to see, please just let us know.